The Geysers of Yellowstone, 5th ed. 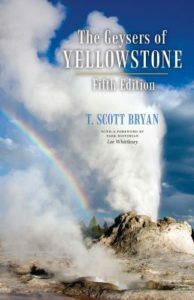 T. Scott Bryan knows his geysers, as evidenced in the fifth edition of his book The Geysers of Yellowstone. In this conveniently organized and very thorough field guide, Bryan shares detailed information about hundreds of geysers in the Yellowstone National Park. Grouped by geyser basins, learning about individual geysers is simple in this easy-to-use guide for park visitors. I have visited Yellowstone National Park only twice, and can only assume this is an exhaustive list of all geysers in the park. The information Bryan shares on these spectacular feats of nature includes historical background, eruption activity, location relative to surrounding geysers, and any special identifiers. The guide also contains numerous photos, maps, charts, and sketches, as well as an appendix of geyser fields around the world. From basic information about geysers to maps of their locations, this field guide is a must-have for park visitors and geyser lovers alike. Georgia is home for Magnolia Grace (Maggie) and her mother. They have lived a comfortable country club lifestyle for as long as she can remember. Her father and his Vermont farm are a shadow of a memory. When he unexpectedly passes, Maggie and her mother must move to Vermont to fulfill the requirements of his will. The move flips Maggie’s world upside down and shakes out all the dusty corners. As the dust settles she finds parts of herself she didn’t known were missing. 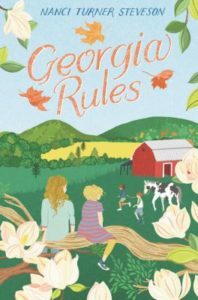 In Georgia Rules, Nanci Turner Stevenson takes on the real struggles of life. Without downplaying the intensity of life’s challenges, Turner uses language and context in which young readers can relate. Those who are holding the tension between being young and growing up will connect with Maggie as she deals with the themes of friendship, love, loss, and forgiveness in real world situations. And for those of us who have already grown up, Stevenson paints such a vivid picture it is instantly recognizable as the harrowing journey between being a child and an adult.